Many wrecks, mostly wooden boats or schooners, date back to the 1800s. 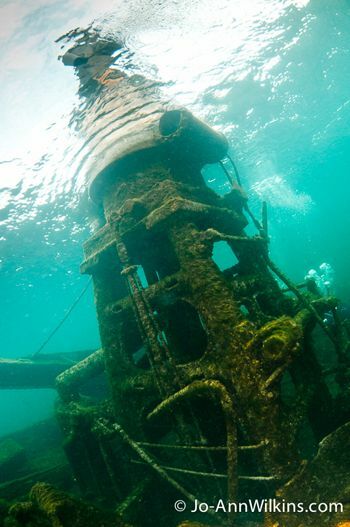 One of the most popular is the wreck of the Lillie Parsons in Brockville. Turned upside-down on the side of a cliff with her belly still filled with coal and her enormous masts pointing downward, she is a pretty wreck to visit. Other wooden wrecks worth diving are the schooner A. E. Vickery, the wooden barque Robert Gaskin and the schooner-barge Kingshorn. There are also steel ships such as the very popular wreck of the Keystorm, which sank in 1912, and the Henry C. Daryaw, lying upside-down on the riverbed. 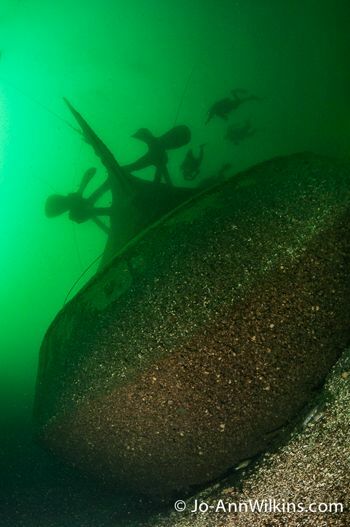 Other steel ships worth diving are the Oconto (although this is a technical wreck), the drill barge America, the highly damaged barge John B. King and the Muscallonge (a very damaged wreck but worth diving mostly for the impressive amount of fish on her). Noteworthy wrecks in the Eastern Lake Ontario area are the Wolf Islander II, the beautiful Comet with its sidewheels still relatively intact, the dredge barge Munson and the three mast schooner George A. Marsh. The schooner A. E. Vickery. This wreck has strong surface current but once on the wreck, divers are shielded from the current. St-Lawrence River. F 9, 1/50, ISO 800. Nikon D300 Tokina 10-17mm. Experienced divers can explore the hold of the A.E. Vickery. St-Lawrence River. F 4.5, 1/60, ISO 800. Nikon D300 Tokina 10-17mm. The schooner-barge Kingshorn with its unique ship’s wheel. F 6.3, 1/100, ISO 400. Nikon D300 Tokina 10-17mm. There are also more recent wrecks that lie in these waters. The most popular is without any question the Roy A. Jodrey, which sank just off the coast guard station on the south shoreline of Wellesley Island in 1974. 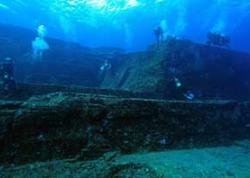 This large freighter (640’ x 72’ x 40’) now lies in 140 to 242 feet of water and is open to only technical divers. Another recent wreck is the Eastcliffe Hall, a 343-feet bulk freight motor vessel that sank in the Morrisburg area in 1970. The upside down steel freighter Henry C. Daryaw. 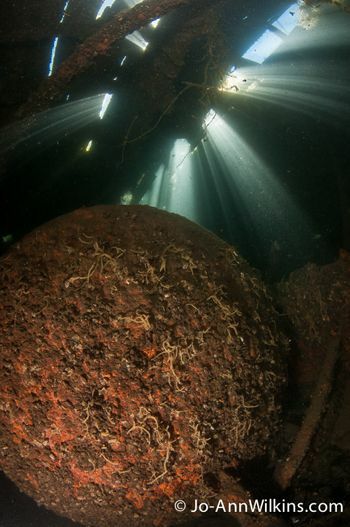 There are plenty of photographic opportunities on this wreck. St-Lawrence River. F 7.1, 1/100, ISO 400, Nikon D300 Tokina 10-17mm. The damaged bow section of the work barge Robert Gaskin. This ship was relatively intact until a few years ago. High diver traffic on this shallow wreck has damaged the fragile 1863 hull. St-Lawrence River. F 5.6, 1/30, ISO 500, Nikon D300 Tokina 10-17mm. Exploring one of the many submerged locks of the old canal. Most locks are accessible from shore and are popular local diving destinations. St-Lawrence River. F 9, 1/80, ISO 640, Nikon D300 Tokina 10-17mm. 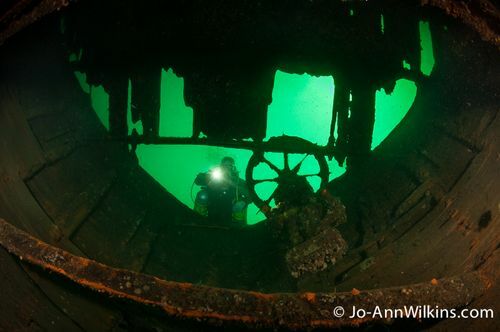 Closer to the Massena area (Cornwall Ontario), divers can explore many structures that were submerged by the construction of our modern seaway in the 1950s. Whole villages were lost when dams and locks were erected in the area and caused massive flooding. Most homes, churches and other constructions were either displaced or demolished prior to the flood but many structures still remain. 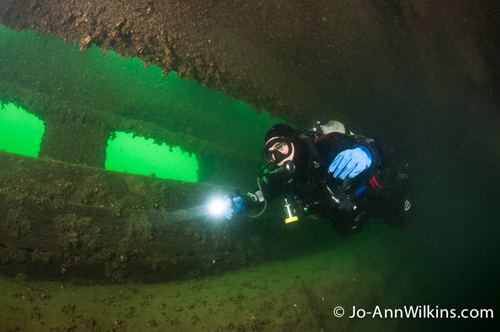 For instance, we can still dive on the former lock system of the old canal. 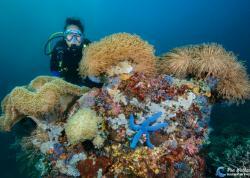 Locks 21, 23 and 28 are easily accessible and are very popular dive sites. Another noteworthy site is the ancient Mille Roches Power House. Her roof and walls were removed in preparation for the St-Lawrence Seaway flooding, but her water turbines, wheel chamber and exciter reservoirs are still intact. Submerged structures such as swing bridges, paved roads, water pipes and building foundations are common in this area rich in history. 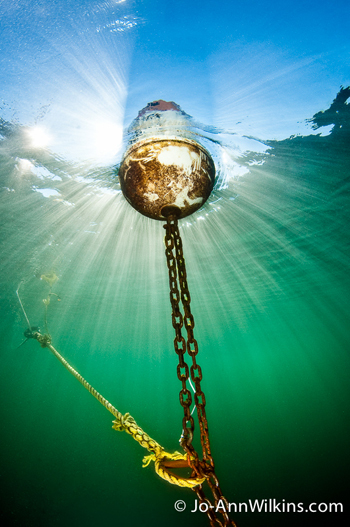 Most of the wrecks in the St-Lawrence river have one thing in common: current. The river is relatively narrow and current is present on every dive site, although it can range from unimportant in some areas and quite strong in others. 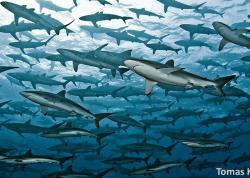 Generally, divers can expect a current anywhere from 0.5 knots to 3 or 4 knots. But don’t let that scare you away! The current is mostly felt at the surface and on ascents and descents. On the bottom, it is often negligible and is easily managed. It is important to attach your camera gear securely on you with one and preferably two clips so you can let go of the gear if the current gets too strong on descents and ascents. I personally always carry my neoprene dome port cover underwater just in case I need to protect my dome if both hands are needed for descent or ascents. Photographers want to try to shield themselves as much as they can from the current and staying close to the bottom helps. There is very little to no current in the Eastern Lake Ontario area. Photo left: Boiler inside the old abandoned steel ferry Wee Hawk. This wreck sits in very shallow water and is interesting to photograph. Visibility can be stirred up pretty rapidly inside the wreck. Divers have reported seeing beavers inside the wreck! F 8, 1/250, ISO 400, Nikon D300 Tokina 10-17mm. Photo right: One of the most popular wrecks amongst local divers, the Conestoga. It lies in shallow water close to shore. It offers many photographic opportunities, with its enormous upright engine sticking out of the water. F 11, 1/50, ISO 400, Nikon D300 Tokina 10-17mm. The sediments on the riverbed are easily disturbed and a careless diver can whip up a ‘silt storm’ pretty rapidly, so photographers must be very careful in these conditions. That said, the advantage of the strong current is that it moves the silt and restores visibility fairly quickly. However, if a silt-out occurs inside a wreck where there is little current, the silt can remain in suspension for hours. When we get to a dive site, I’m always the first one in the water, ready to go as soon as the boat anchors. This allows me to photograph the main attractions of the wreck before fellow divers, even if they are really careful, mess up the visibility. General visibility varies a lot in the river. Late summer, fall and winter offer the best visibility, while early spring offers poor visibility and is not really good for photography. Mastering strobe positioning to light your subject is of utmost importance. Since there is a lot of sediment in suspension, you really need to spread your strobe arms as far out as possible and to point them outwards a little. You definitely want as little light as possible to hit the particles between your lens and your subject. If you have extra strobe arm extensions, this is the place to use them. From many years of doing photography in the river, I find that using your strobes at half power rather than at full power gives better results (less backscatter and less of a bluish-white spotlight effect on the sides of your image, especially on deeper darker dives). You need to get as close as possible to your subject to get good results. Of course, this is general underwater knowledge but I would say that in the river, it is even more relevant. 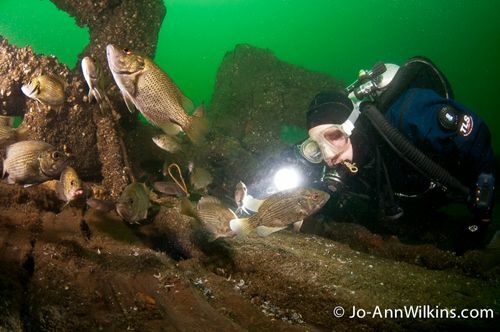 Using a diver in your pictures helps to provide perspective on the size of the wrecks. However, be sure that you coach your model before the dive. Ask him to remain away from the easily disturbed bottom. Shooting upwards to capture surface light is a must. Ambient light vanishes rapidly as you descend and pointing your camera upwards will bring natural light into your picture. 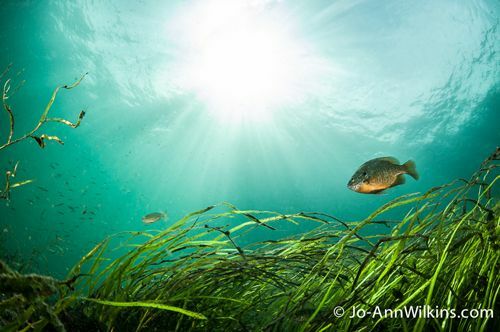 The water has a glowing green color to it and it is interesting to incorporate it into your image. You will find that you will have to work at higher ISOs and slower shutter speeds to capture the ambient light in these conditions. Photographers will find that wide-angle photography is usually the best choice because of all the beautiful large wrecks. Points of interest on most of the wrecks in the river are the props, the anchors, wheel, windlass, bow and stern. 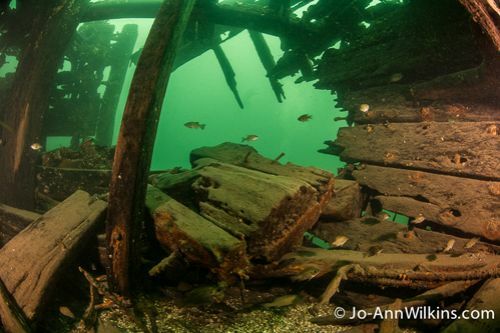 On the wrecks of eastern Lake Ontario, you can still find beautifully preserved wooden deadeyes, tools and artifacts. Some wrecks even have intact canned goods on deck. 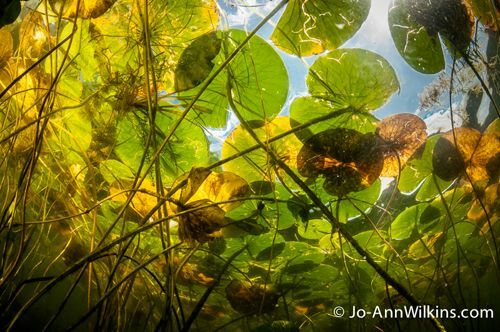 Besides the wrecks, there are plenty of other interesting things to photograph, such as a large variety of fish, lily pads, tree roots, etc. Sure, the fish are not as colorful and plentiful as you would find in tropical destinations, but they still make interesting subjects. Furthermore, photographers shouldn’t leave their macro ports at home! There are plenty of zebra mussels, freshwater sponges and other smaller organisms to photograph too. Even though most underwater photographers will naturally travel to tropical destinations, Eastern Lake Ontario and the St-Lawrence River, with their rich maritime history, warm water in the summer and an abundance of photographic subjects, are definitely destinations worth discovering. Divers who would like to learn more on the wrecks of the St-Lawrence River and the Great Lakes should read The Great Lakes Diving Guide Enlarged Second Edition by Cris Kohl (2008). This well documented reference guide is a must read for anyone interested in discovering the area. Mooring line on one of the many wrecks. F 9, 1/250, ISO 200, Nikon D300 Tokina 10-17mm. Shallow dive from shore. St-Lawrence River. Rockport area. F 10, 1/250, ISO 400, Nikon D300 Tokina 10-17mm. Lily pads are common in the St-Lawrence River. F 11, 1/250, ISO 400, Nikon D300 Tokina 10-17mm.